November is the time to look back at the achievements of baseball’s greatest players and select the one player in each league who meant the most to his team, and the sport, during the previous season. The player whose superior play, remarkable achievements and inspirational leadership made him the Most Valuable Player (MVP) in the American and the National leagues. Eight 500 Home Run Club members were selected as league MVPs two or more times. Frank Robinson was the first, and still the only, player to win a Most Valuable Player Award from both the American and National League. Ernie Banks was twice named league MVP, despite playing on losing Chicago Cubs teams. Alex Rodriguez, Mike Schmidt, Mickey Mantle and Jimmie Foxx all won three MVP awards, and Barry Bonds has been voted the National League MVP an unparalleled seven times. 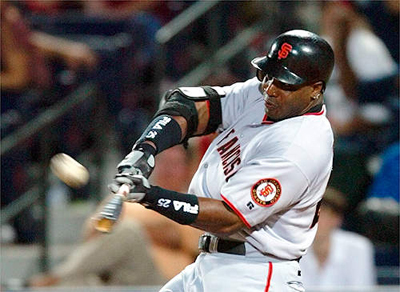 By winning his final MVP award at the age of 40, Bonds became the oldest player to win the honor. He received 24 first-place votes and 407 points overall in balloting by the Baseball Writers' Association of America to earn the award for the fourth straight season. Bonds is the only player with more than three MVP awards and the only one to win more than two in a row. MVP awards are fine, but I need a (World Series Championship) ring,” was Barry’s only comment at the time.